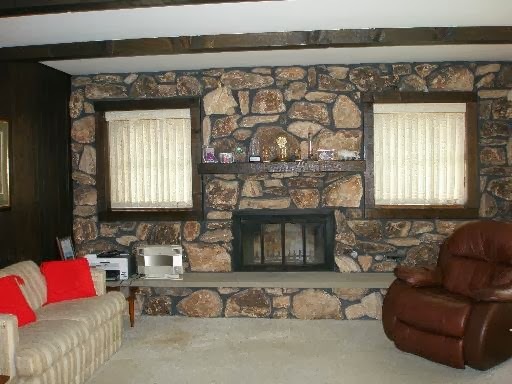 Here is what our fireplace use to look like - you can say it, GROSS! At least to us it was, just so old and not our taste, plus it took up the entire wall!! 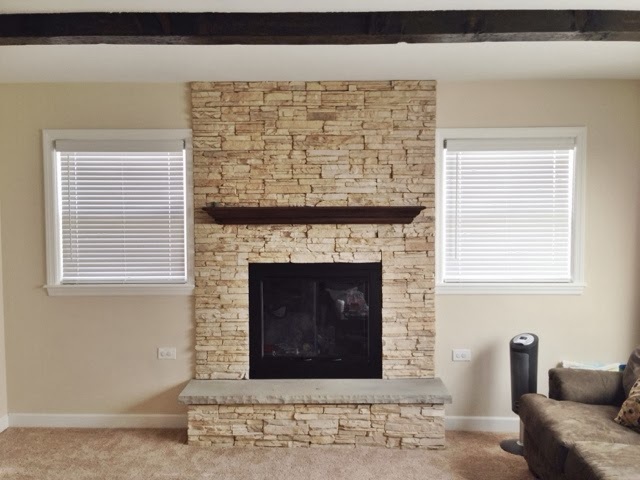 We knew we wanted to do a fireplace remodel before putting in new carpet, and we are so glad we were smart enough to do that because knocking down that old fireplace sure did make a MESS of our old carpet. 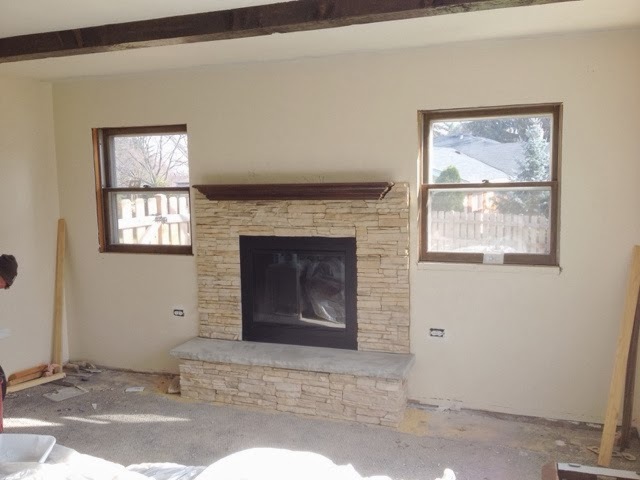 We hired a guy to do the demo part of removing the old fireplace. Part of me (the cheap part) was not happy to pay someone to do something that we could have easily done (of course I say this after I saw it get done) but I knew with 2 little kids, both the hubs and I working full time, and weekends jam packed there was just not time for us to do it. We searched the internet for different stone options, I knew right away I liked the thin stacked stone look. We ended up using Eldorado Stone in Dry Creek. Initially we only went half way up the wall. As soon as it was done, the hubby was not happy. He wanted the stone to the ceiling. Again, the cheap part of me was perfectly happy with the stone only going halfway, see, not so bad right?? But then the idea to go to the ceiling grew on me more and we ordered another box, paid more money to have it installed, and viola! 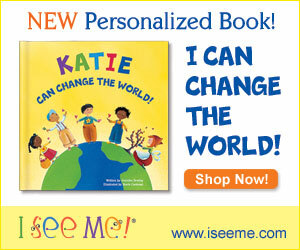 Here is the end result! Just gorgeous if I do say so myself!!!! 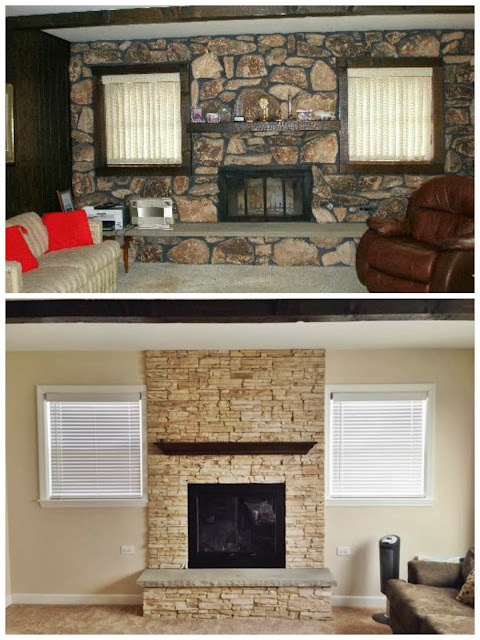 The hubby put in new woodwork around the windows, ripped off the wood paneling on the walls, painted the walls and ceilings and bought new window treatments. Of course the carpet is new too and is sooo nice and soft. This room has totally transformed and is now our favorite room.